Now, Acrolinx would turn most of this text red with spelling issues. The expressions "slithy toves" or "mimsy" aren't going to be in any standard dictionary. However, it would be annoying if Acrolinx found these issues every time you ran a check, so you might configure Acrolinx to ignore the whole excerpt. You can do this by filtering out text in a certain font or style. Usually, you configure the filter settings in the Acrolinx options, on the Filter tab. If you can see the Filter tab, you can jump to the next section: The Filter Tab . If you don't see this tab, it means that your Acrolinx administrator has enabled checking profiles . In this case, filter settings are part of a larger group of settings called "extraction settings". If your administrator has enabled checking profiles, they probably want to manage the extraction settings centrally, which is why the Filter tab is a little more hidden. However, there are always valid reasons for wanting to change the filter settings yourself, so here's how to open the filter tab if you don't see it in your options. 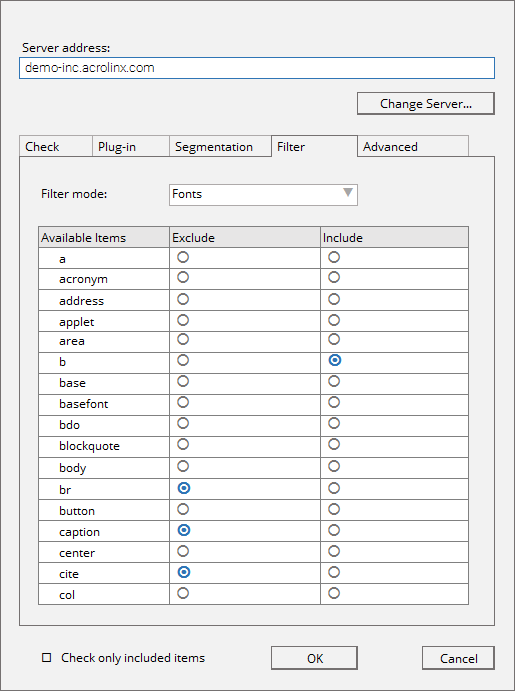 To create a set of extraction settings, select the Filter:Fonts or Filter:Styles depending on how you want to filter your content. To edit an existing set of extraction settings, select the name of those settings. For example, you have previously created extraction settings for Articles, an item like "Saved extraction settings: Articles" should appear in the extraction settings list. If you see the prefix "modified" before a set of extraction settings, it means that you've saved some settings but they're only valid for this session. If you close and open your editor, you won't see them anymore. To have your settings saved permanently, have your profile administrator associate the extraction settings with a checking profile. On the filter tab, you'll find a list of fonts or styles that Acrolinx detected in your document. Use the radio buttons in each row to select the filter settings for the relevant fonts or styles and click OK . If you're not sure what to select, see our guidelines on classifying elements for segmentation . Again, the filter tab will look a little different depending on whether checking profiles are enabled. You can choose to filter by fonts or styles. What you select here will change what you see in the Available items column. For example, if you switch from "Fonts" to "Styles", the list refreshes to show all the available styles in your document. You can keep your selections if you switch between modes. If you've selected some fonts then switch to "Styles", your selections will still be there when you switch back to "Fonts". You find the filter tab in a separate Extraction Settings window. The filter tab includes a Settings name field which you can use to give your settings a human-reable name, or any name really, like "Gary". This is better than the default name which is either "Styles" or "Fonts". For example, the name "Fonts" isn't exactly memorable if you're trying to tell the difference between settings that you've saved a while ago. Not that "Gary" would be more helpful, but at least you chose it. Excluded Never check this content. Included Always check this content. This the default for all fonts and styles anyway, but you'll need to explicitly select this if you've enabled the option Check only included items . Empty Never check this content but include it in the grammatical structure of the sentence. The options Use slithy toves and Gyre and gimble in the wabe will cause a Jabberwocky to appear." The options and will cause a Jabberwocky to appear. The options (empty) and (empty) will cause a Jabberwocky to appear. In this last example, the grammatical structure is retained and Acrolinx will let it be. Check only included items Only check content that you've selected as included. On rare occasions, you might have a document where most of the content needs to be excluded. For example, if you're writing API documentation, you probably have a lot of code samples that you don't want Acrolinx to check. It might take a while to select all the fonts and styles to be excluded. What might be faster, is to tell Acrolinx what to explicitly include and ignore the rest. That's when you would use this option. Now, Acrolinx would turn most of this text red with spelling issues. The expressions "slithy toves" or "mimsy" aren't going to be in any standard dictionary. However, it would be annoying if Acrolinx found these issues every time you ran a check, so you might configure Acrolinx to ignore the whole excerpt. You can do this by filtering out text in a certain field. To create a set of extraction settings, select the Filter:Fields . On the filter tab, you'll find a list of fields that Acrolinx detected in your document. Use the radio buttons in each row to select the filter settings for the relevant fields and click OK .
You can choose to filter by fields or not to filter at all. This is better than the default name which is either "Fields". For example, the name "Fields" isn't exactly memorable if you're trying to tell the difference between settings that you've saved a while ago. Not that "Gary" would be more helpful, but at least you chose it. Included Always check this content. This is the default for all fields anyway, but you'll need to explicitly select this if you've enabled the option Check only included items . It might take a while to select all the fields to be excluded. What might be faster, is to tell Acrolinx what to explicitly include and ignore the rest. That's when you would use this option. In Microsoft Word, linked styles contain both a paragraph style and character style type. For example, all default heading styles, such as Heading 1 and Heading 2 , are linked styles. The Acrolinx Plug-in for Microsoft Word handles linked styles differently from other styles. If you filter text based on linked styles, make sure that you understand these differences. In Word 2007, the plug-in can only filter on a linked style which is applied to a paragraph . To check whether a style is linked, open the Modify Style window and view the Style type property. The Style type property is set to Linked (paragraph and character) . 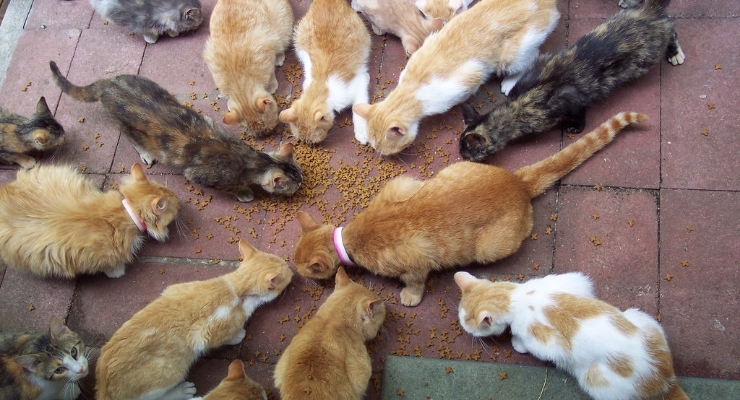 If you've ever watched cats eating, you might have noticed that they tend to strain out the best morsels through their teeth and leave the undesirable bits behind - no matter how well you mix it up. That's kind of how Acrolinx sees a structured document. Your words are the juicy morsels that need to be sucked out of the dreary clumps of markup. However, Acrolinx can't separate the succulent from the superfluous without guidance. Acrolinx needs instructions on how to get the text out of the markup. Usually, it's your Acrolinx administrator's job to provide these instructions which we call "extraction settings". Your administrator sets up these settings for all the writers in a team. If you're interested in this process or need to configure text extraction yourself, we highly recommend our introductory article " getting Acrolinx to correctly read your text properly " first. 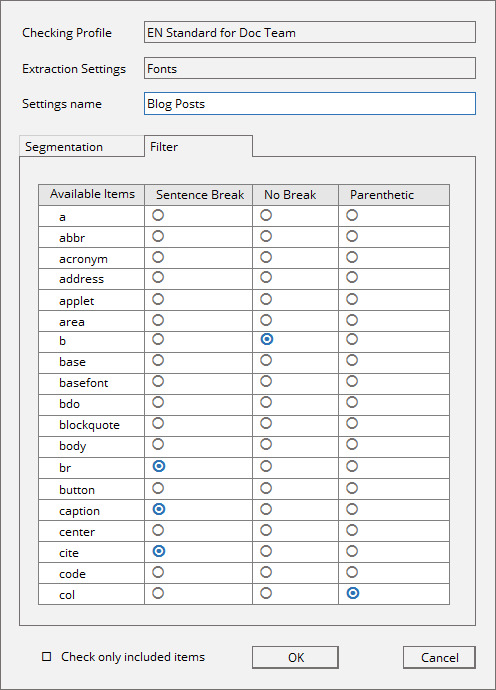 Segmentation settings that define how to slice up the continuous string of characters that make up your content. Usually, you configure the these settings in the Acrolinx options, on the Segmentation and Filter tabs. If you can see these tabs, you can jump to the next section: The Segmentation and Filter Tabs . If you don't see these tabs, it means that your Acrolinx administrator has enabled checking profiles . If your administrator has enabled checking profiles, they probably want to manage the extraction settings centrally anyway, which is why these tabs are a little more hidden. However, there are always valid reasons for wanting to change these settings yourself, so here's how to open the segmentation and filter tabs if you don't see them in your options. To create a set of extraction settings, select your document type. You document type should show up in the list as a document type identifier. For example, if you’re adding extraction settings for DITA tasks, you should see an item like Filter: -//OASIS//DTD DITA Topic//EN similar to the previous illustration. For example, if you or an administrator has previously saved extraction settings for DITA tasks, an item like "Saved extraction settings: Tasks" should appear in the extraction settings list. On the segmentation tab and filter tabs, you'll find a list of elements that Acrolinx detected based on your document type. Again, these tabs will look a little different depending on whether checking profiles are enabled. 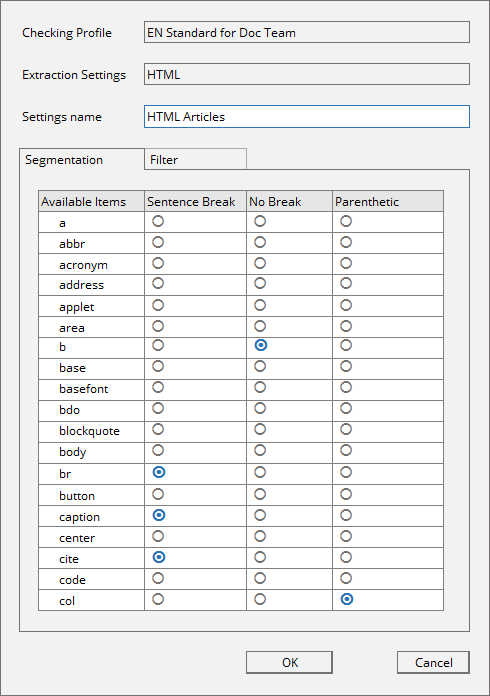 The segmentation and filter tabs show the DTD or Schema that Acrolinx has identified based on your document structure. Once you save your settings, Acrolinx will remember them for any document that's based on the same DTD or Schema. However, if there are small differences in a public or system ID Acrolinx will forget your settings. This can be a very annoying problem but there’s a workaround . You find the segmentation and filter tabs in a separate Extraction Settings window. This window includes a Settings name field which you can use to give your settings a human-reable name, or any name really, like "Gary". This is better than the default name which is usually the public ID of your DTD. For example, the name "xhtml1-transitional.dtd" isn't exactly memorable if you're trying to tell the difference between settings that you've saved a while ago. Not that "Gary" would be more helpful, but at least you chose it. Included Always check this content. This is the default for all elements anyway, but you'll need to explicitly select this if you've enabled the option Check only included items . The options <uicontrol> Use slithy toves </uicontrol> and <uicontrol> Gyre and gimble in the wabe </uicontrol> will cause a Jabberwocky to appear." The options <uicontrol>empty</uicontrol> and <uicontrol>empty</uicontrol> will cause a Jabberwocky to appear. It might take a while to select all the elements to be excluded. What might be faster, is to tell Acrolinx what to explicitly include and ignore the rest. That's when you would use this option. Sentence Break Treat the end of the element as the end of the sentence, even if there's no period after the last word. No Break If a word is fragmented by inline elements, keep those fragments together as one word. For example, take the text "H<sub>2</sub>O". By default, Acrolinx would fragment the characters into separate words by replacing <sup> element with spaces. This setting prevents that from happening. Parenthetic Treat the element as separate sentence, even if it's embedded in another sentence. This situation is kind of rare, but it's good to know about it anyway. You know, just in case. By the way, Arbortext Editor uses different DTDs for the "normal" view and the "resolved document" view ( Edit > Edit Resolved Document For Styling ). If you check in both views, you'll need to set the segmentation options for both these DTDs.